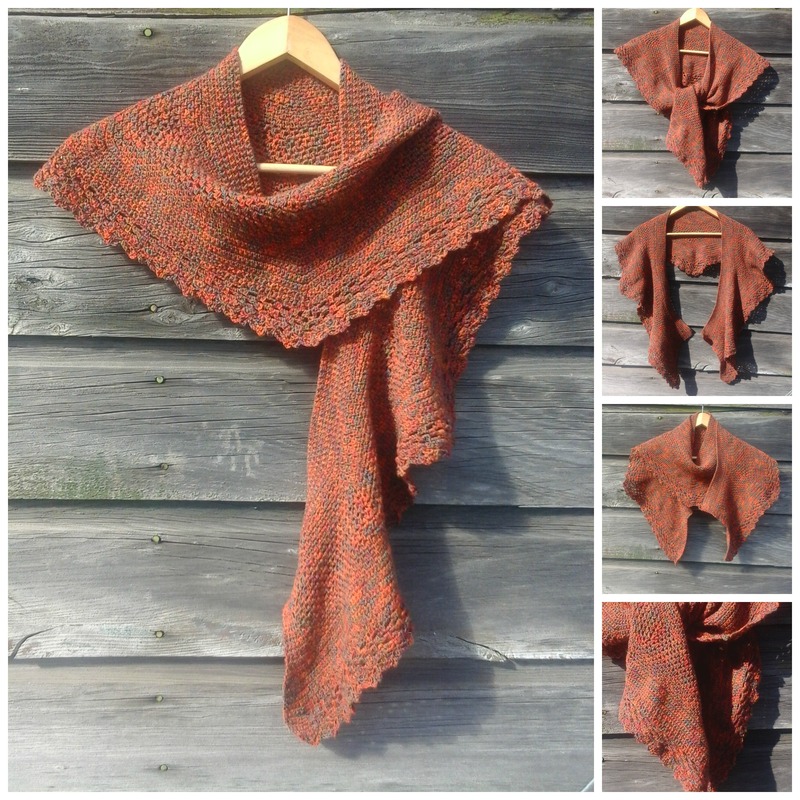 The free pdf pattern for these 3 designs is now available in my Ravelry Store. 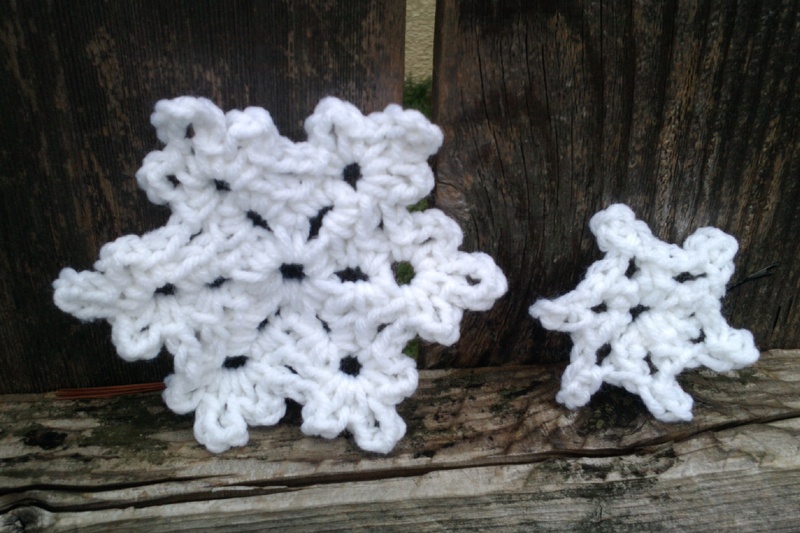 Make them in different colours for different purposes and seasons! 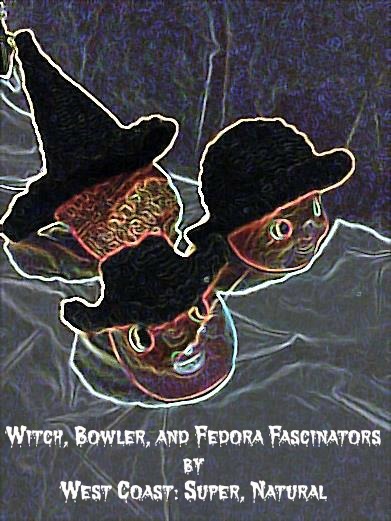 The witch hat would be perfect as a princess’s or wizard’s hat; the bowler and fedora would be cute summer accessories in pastels or bright colours. They can be easily made larger by using a chunky weight yarn with a larger hook, which would give added textural interest, too. 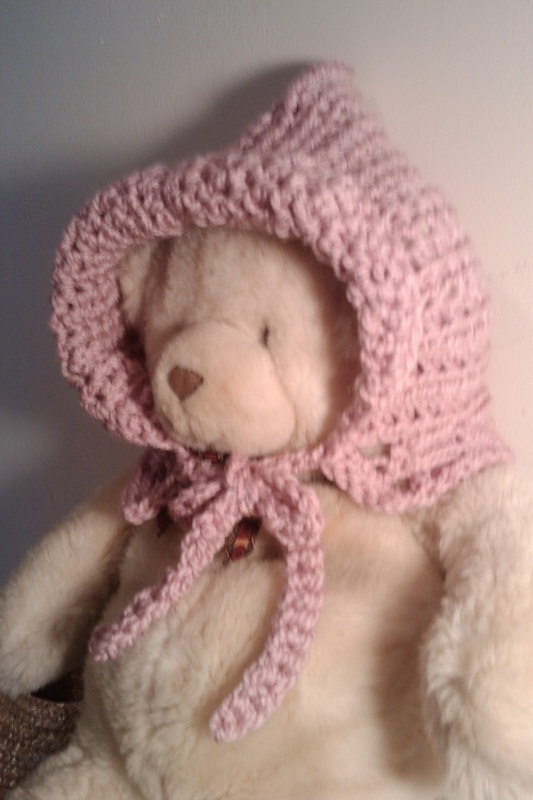 They are nice little doll and teddy bear accessories for children’s play time. 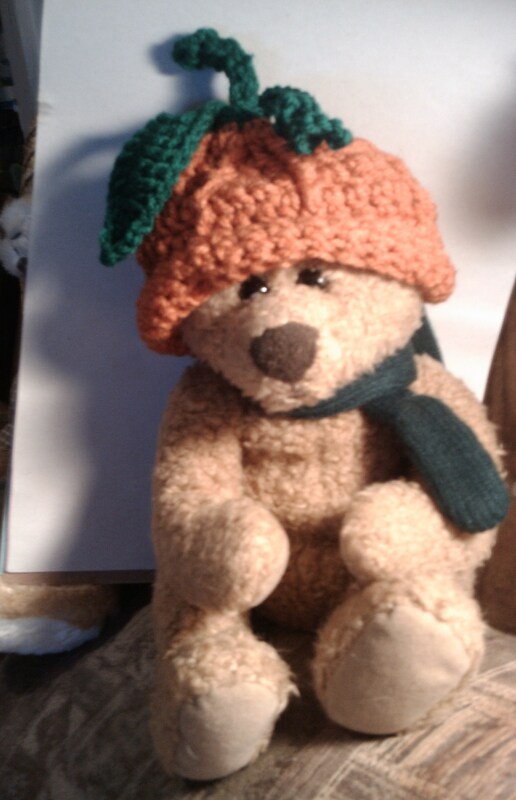 If you need any help with the pattern or find any errors, please contact me. It is often quickest to contact me with a message on my West Coast: Super, Natural Facebook Page. 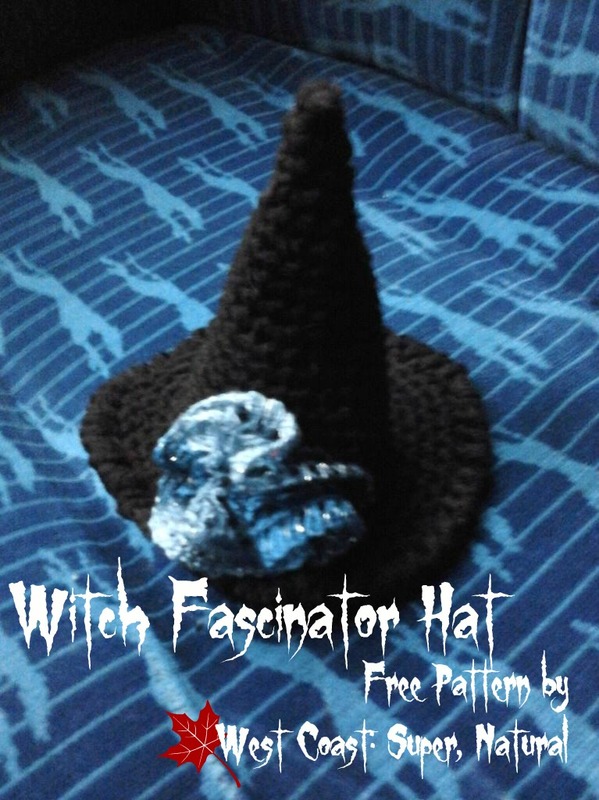 If you ‘Like’ my page and keep it in your news feed by commenting occasionally or just clicking ‘like’ on a post you will see new patterns as they become available, as well as giveaways and more! Thanks for trying my designs, I hope you enjoy them. WHY PAY $4o, $50, $80 to $280 ???? 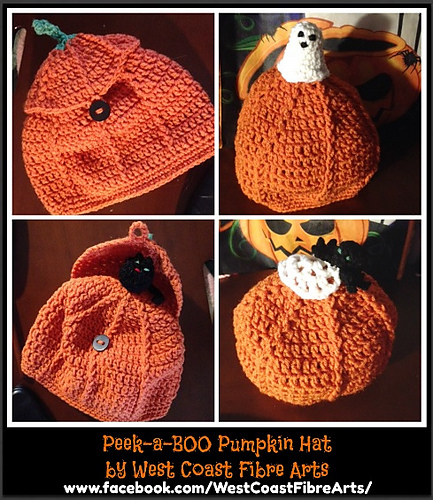 YOU CAN MAKE YOUR OWN ~ LEARNING TO CROCHET IS FUN AND THIS HAT IS AN INTERMEDIATE PROJECT, JUST MAKE A COUPLE OF SIMPLER PROJECTS FIRST…OR BE BRAVE AND JUMP RIGHT IN AND MAKE IT! LOTS OF PHOTOS TO HELP YOU OUT AND I CAN ALWAYS HELP IF YOU HAVE DIFFICULTY WITH ANY PART OF IT. 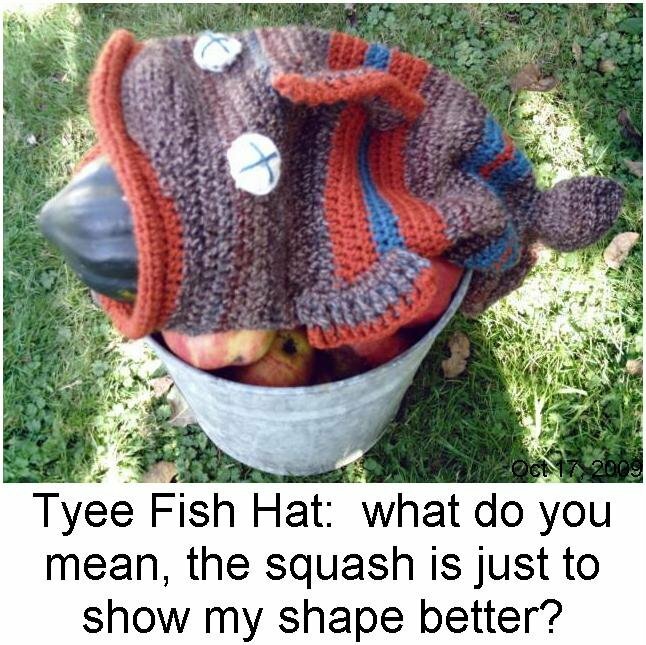 I DESIGNED THIS HAT AND HAVE MADE MANY, AND MANY OF THE HATS BEING SOLD ON ETSY AND ON EBAY ARE MADE FROM MY PATTERNS SO YOU CAN SEE SOME EXAMPLES ONLINE AND SEE HOW EASY IT CAN BE TO MAKE YOUR OWN! 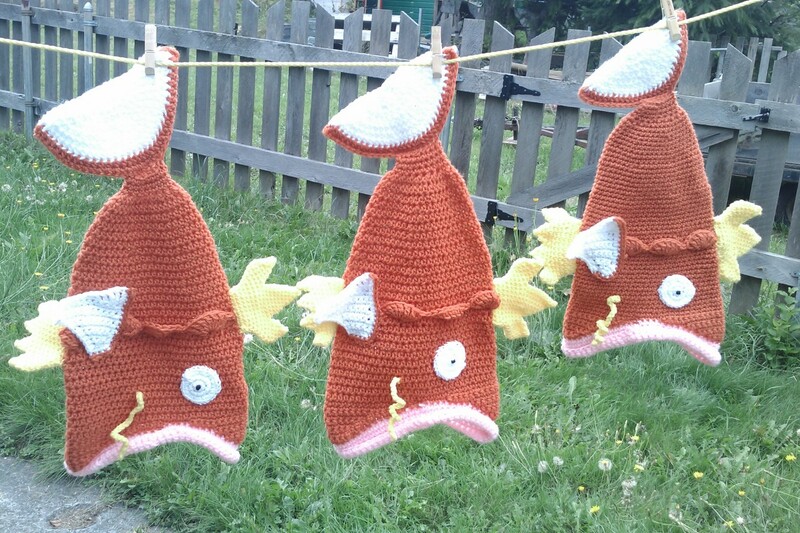 THOUGH SOME HAVE SINCE REMOVED THE LINK TO MY RAVELRY PATTERN MANY HAVE NOT–THESE PICTURES SHOW THAT THEY WERE MADE FROM MY DESIGN AND YOU’LL FIND LOTS MORE TOO IF YOU NEED INSPIRATION–I HAVE SOLD HUNDREDS OF FISH HAT PATTERNS! PLEASE READ MY COPYRIGHT INFORMATION PAGE. 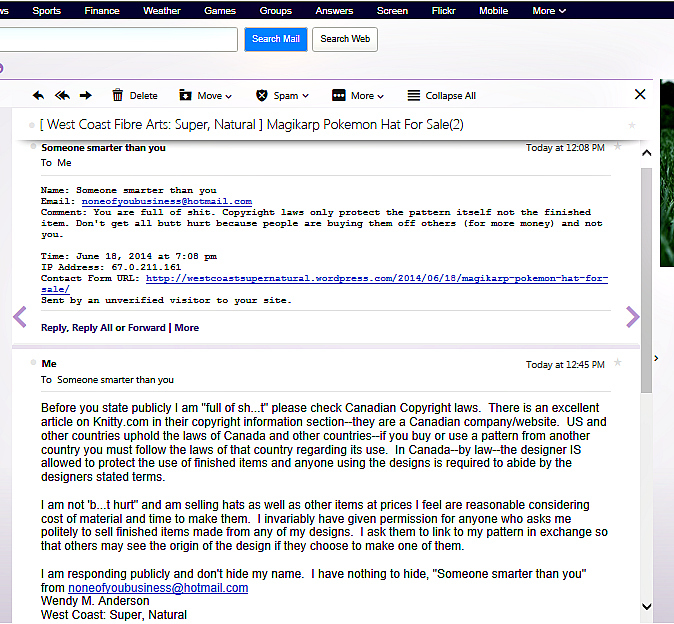 DO NOT POST ANY MODIFICATIONS ONLINE WITHOUT MY PERMISSION, AND PLEASE WRITE TO ME FOR PERMISSION BEFORE YOU SELL ITEMS MADE FROM ANY OF MY DESIGNS–YES, CANADIAN COPYRIGHT LAW DOES GIVE THE DESIGNER THE RIGHT TO NOT ALLOW MODIFICATIONS TO BE PUBLISHED/POSTED, SALES OF FINISHED ITEMS, ETC. WHEREVER YOU LIVE–COPYRIGHT LAWS ARE UPHELD INTERNATIONALLY. 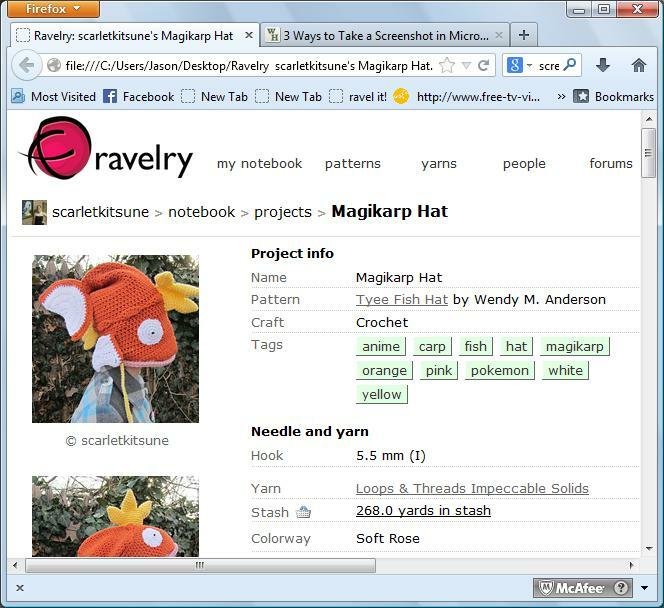 THERE IS A GREAT ARTICLE ON KNITTY.COM (A CANADIAN WEBSITE) BY A CANADIAN INTELLECTUAL PROPERTY LAWYER, AND IF YOU SCROLL DOWN NEAR THE END OF THE ARTICLE TO HER POINT “5” IT DISCUSSES SALE OF FINISHED ITEMS (WHICH SHE CALLS ‘WIDGETS’ AS AN EXAMPLE). 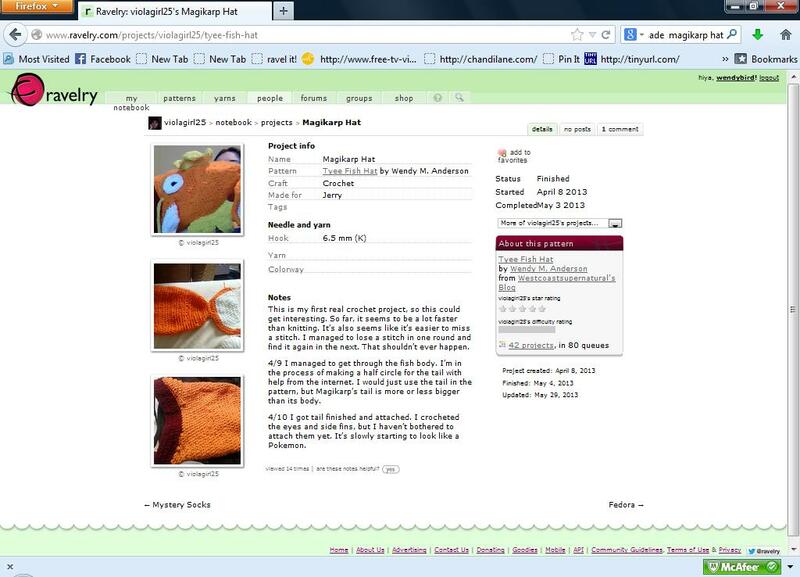 I KNOW YOU CAN MAKE ONE FOR $10 /YARN, MY $5 PATTERN, AND 4 HOURS OF YOUR TIME!!! 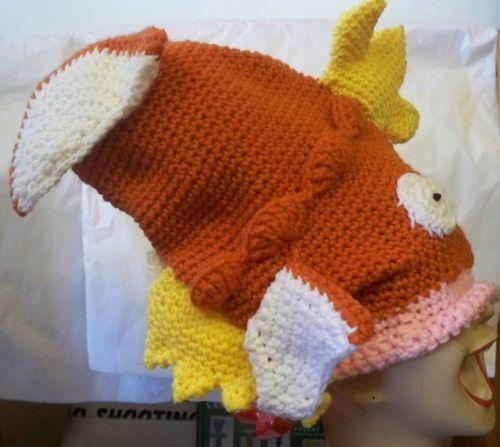 YOU CAN GET YOUR GRANNY OR YOUR AUNTIE OR YOUR MOM OR YOUR FRIEND TO MAKE A MAGIKARP HAT FOR YOU–OR LEARN TO CROCHET AND MAKE ONE YOURSELF! IT IS EASY AND FUN. 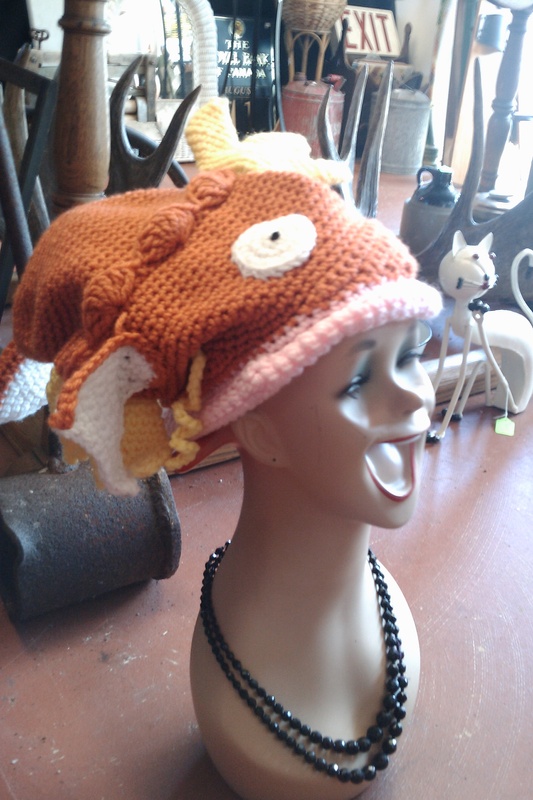 OR ORDER A HAT ~ $50. PLUS SHIPPING AND HANDLING. 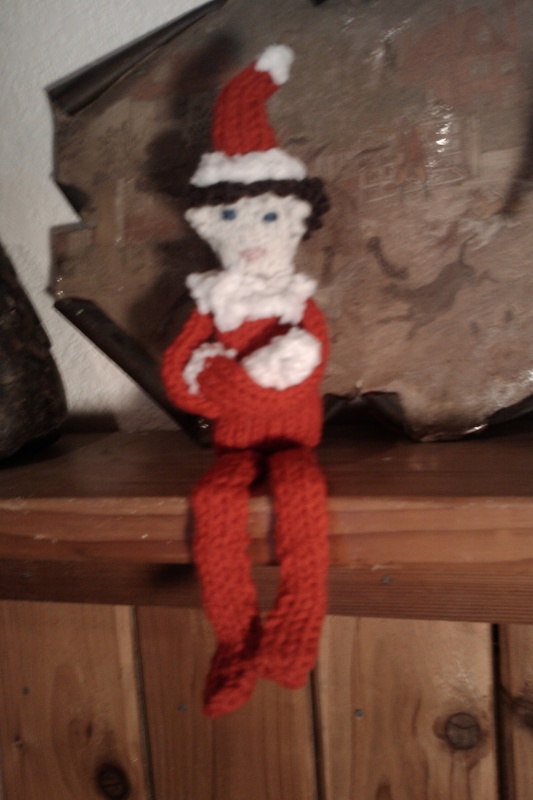 BY SENDING ME YOUR PAYPAL EMAIL AND YOUR ADDRESS SO I CAN WORK OUT SHIPPING. 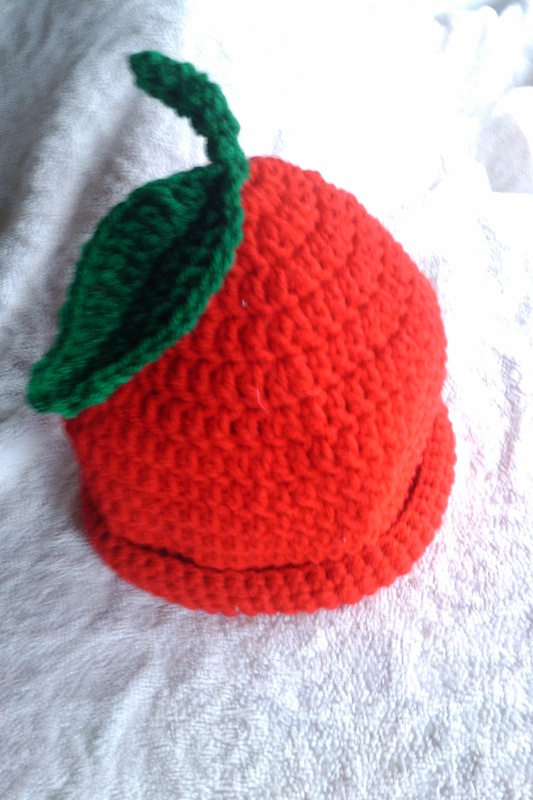 I WILL SEND YOU AN INVOICE AND AS SOON AS IT IS PAID I WILL MAKE YOUR HAT!!! TELL ME IF YOU WANT A SMALL 18″ OR A 22″ HEADSIZE. 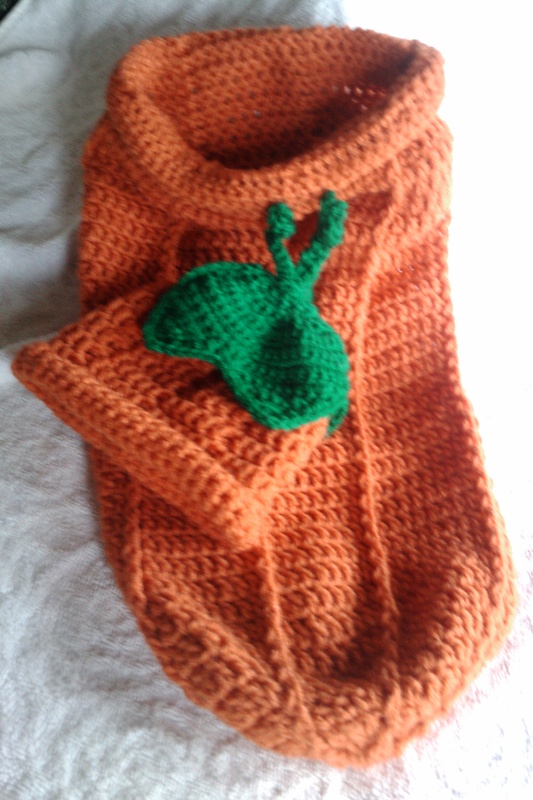 THESE ARE UNSTRETCHED SIZES–THE SMALL WILL FIT MOST YOUTH AND SMALL/MEDIUM HAT SIZE FOR WOMEN, OR THE LARGE WILL FIT MOST MEN AND WOMEN’S LARGE SIZE. IF YOU WISH TO COMMENT I WILL READ THE COMMENTS AND RESPOND IF THEY ARE POLITELY EXPRESSED. HERE IS THE FIRST NOT-TOO-POLITE COMMENT FROM SOMEONE WHO CLEARLY DOESN’T WANT THEIR NAME/IDENTITY KNOWN. CLICK ON PHOTO TO ENLARGE AND READ. MY EMAIL REPLY WAS NOT DELIVERED AS “MAILBOX UNAVAILABLE” SO HOPEFULLY “NONEOFYOUBUSINESS” READS MY RESPONSE HERE. IN FUTURE I WILL NOT RESPOND TO ANY EMAILS OR OTHER COMMUNICATIONS THAT CONTAIN VULGARITY OR ARE RUDE IN NATURE. 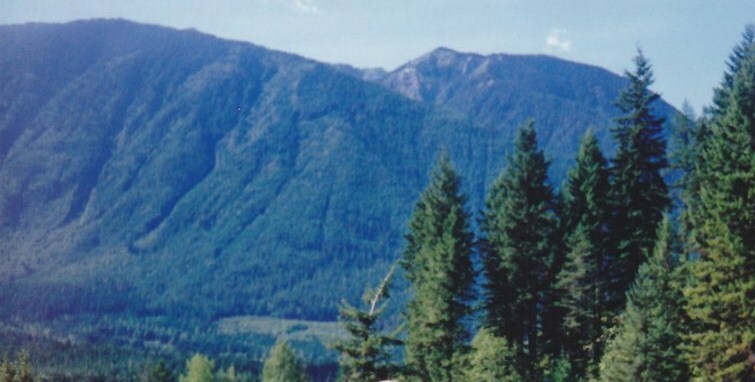 Most of the years from the age of 10 until my mid-thirties I lived directly across the valley from True Blue Mountain, which is south-west of the incredibly beautiful village of Kaslo, BC. In the spring, we’d hear avalanches come thundering down the ravines, and rush outside to watch. In the summer, we’d hike up its slopes…and always, from dawn until night, it was a large and comforting presence in our lives. Even on foggy summer nights, glimpses of True Blue could be seen. 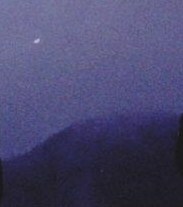 When I think of all the things I miss most about living in my mountain homes, True Blue is near the top of the list. 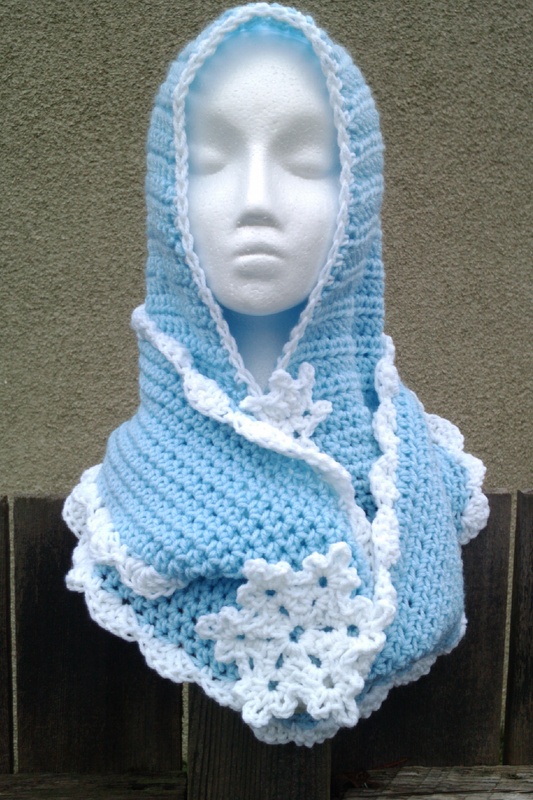 Therefore….this Hood pattern is named in honour of True Blue Mountain. 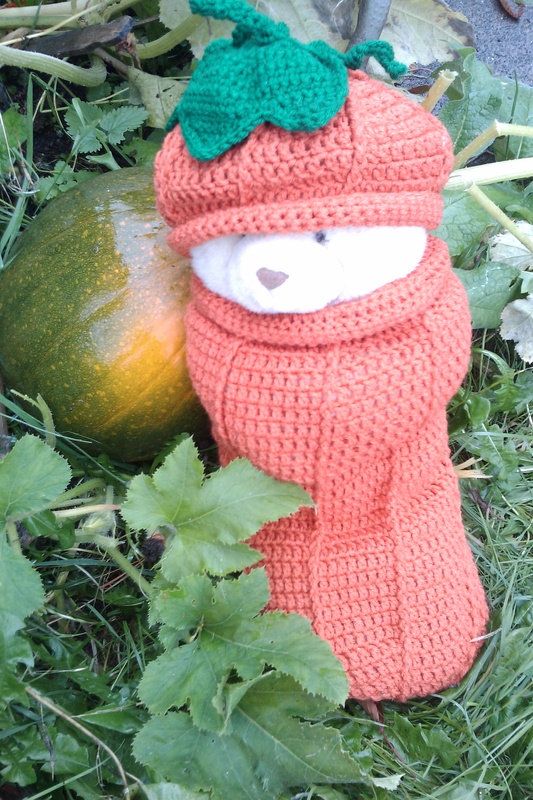 There are lots of photos to help make this using any yarn you choose! 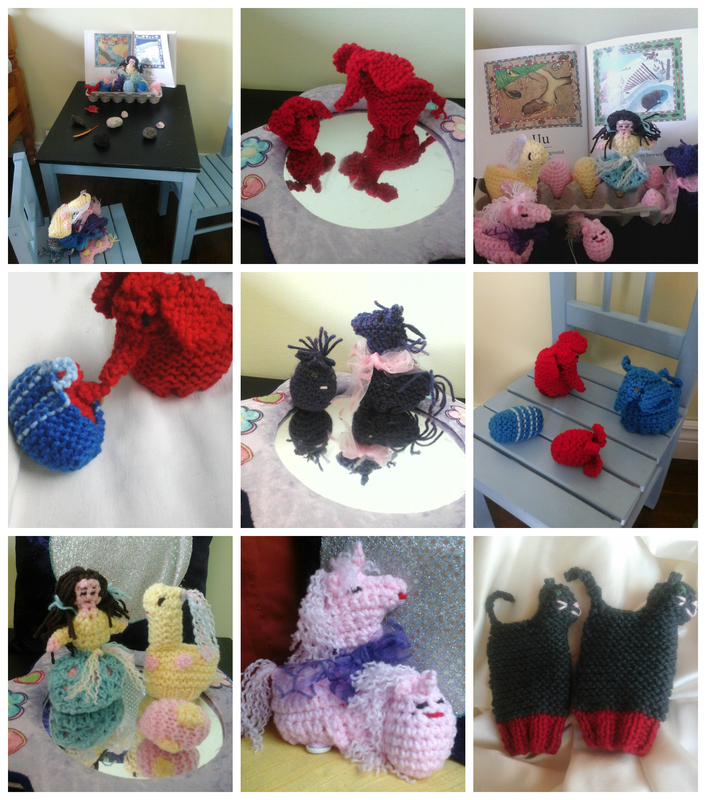 It is worked from the top down, and there are no seams at all…quick, easy, fun! It is FREE for 1 WEEK ONLY! On Dec. 2/2013 it will be a paid pdf file. 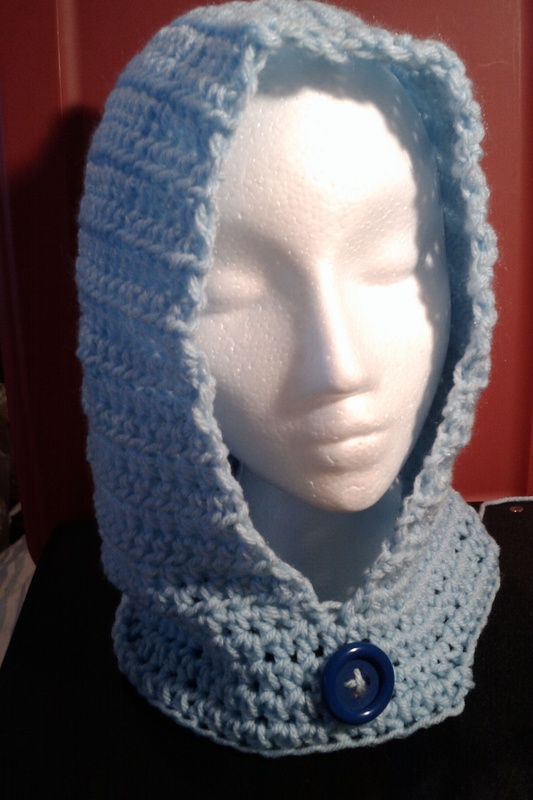 This hood can be made with any yarn–and the right hook for your yarn, of course. 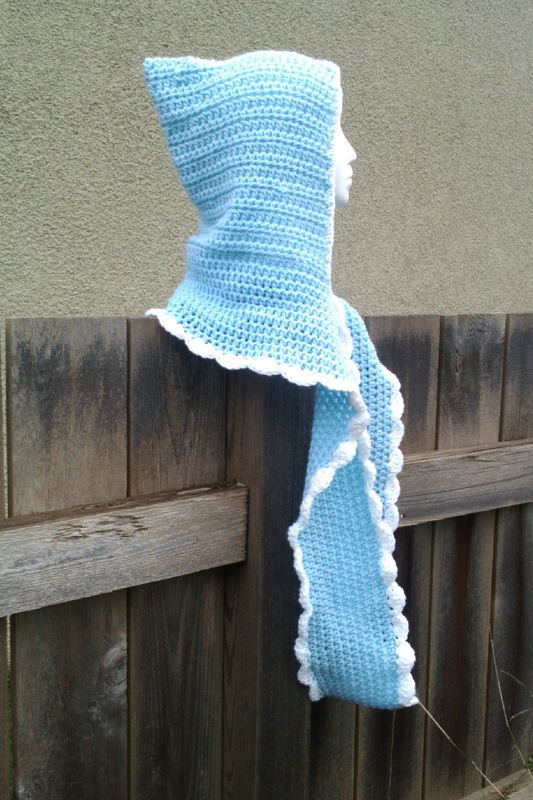 I will be making my first True Blue Mountain Hood using Red Heart Super Saver and a 7mm hook; this hook is larger than most people would use with the yarn, because I live on the west coast which is very mild in temperature–the larger hook gives a cloth which is lighter and more open. 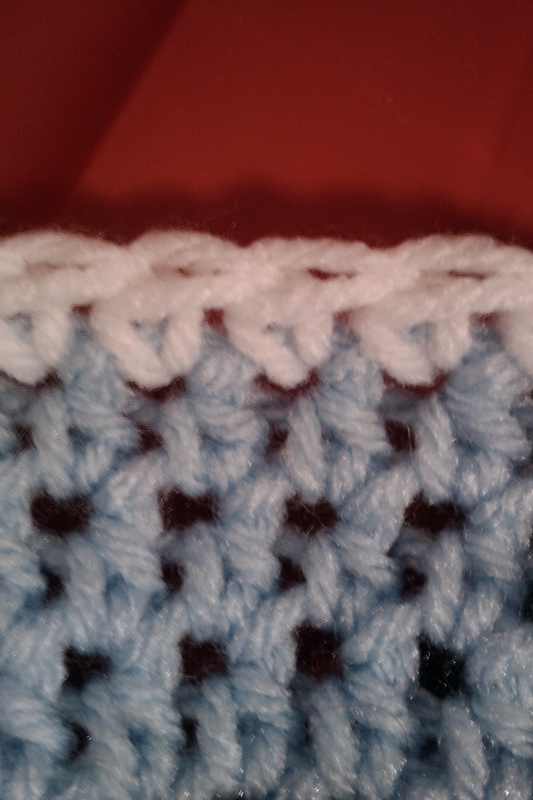 You can always crochet a little square to see what hook/stitch you like. 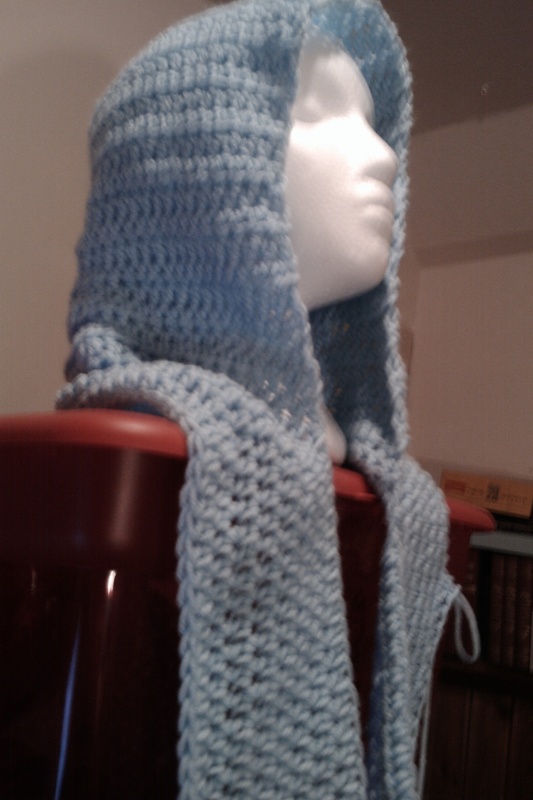 For this Hood you can also choose what stitch you want to use. 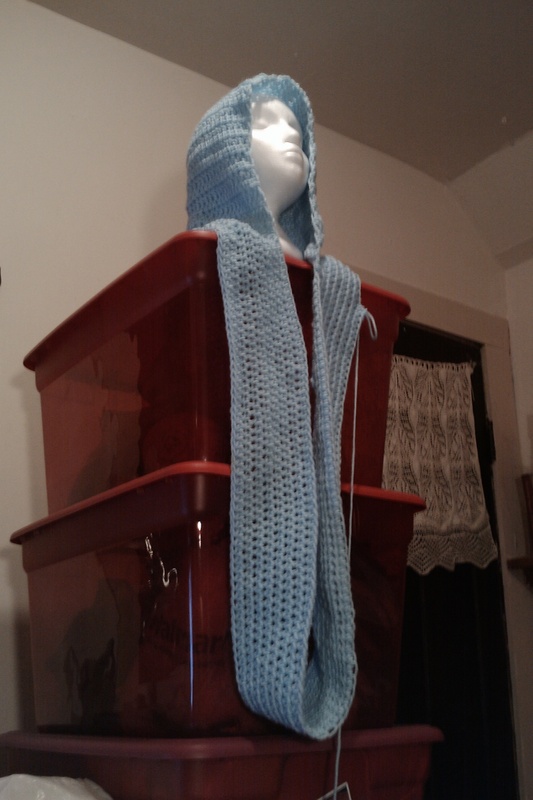 I used half double crochet to make the first Hood. 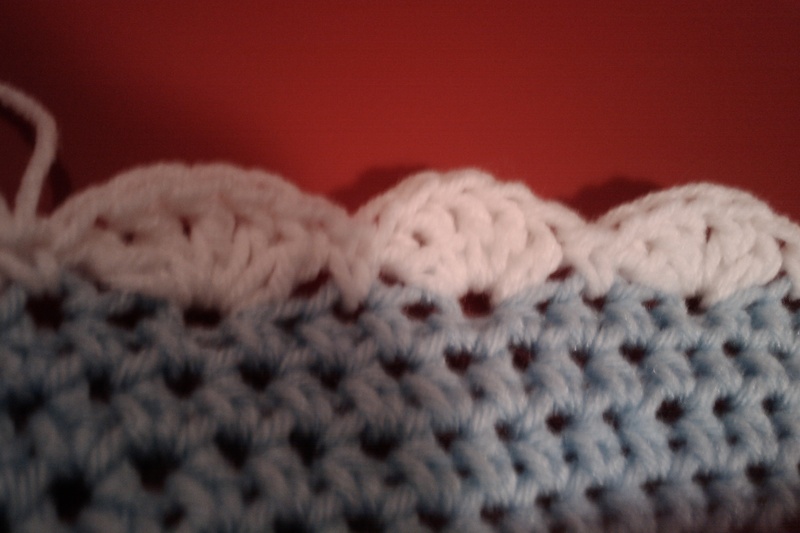 Or make a simple but pretty shell border. 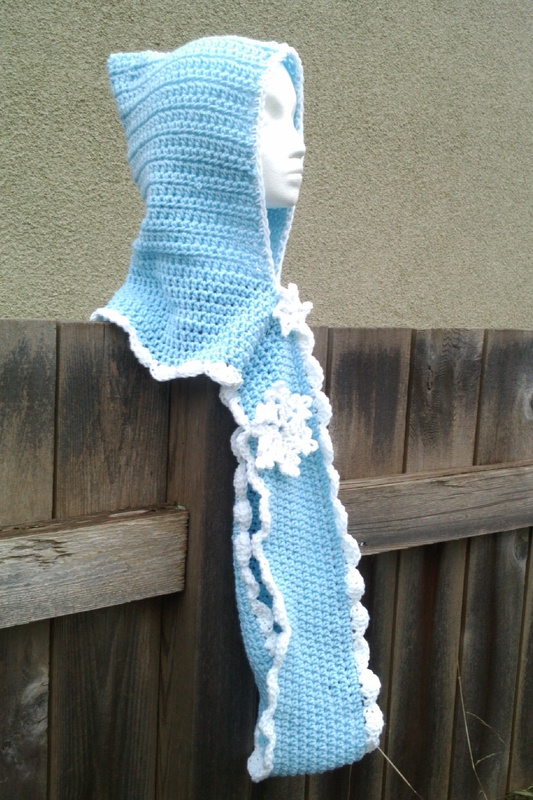 This is the BORDER OPTION I used on my tutorial hood! 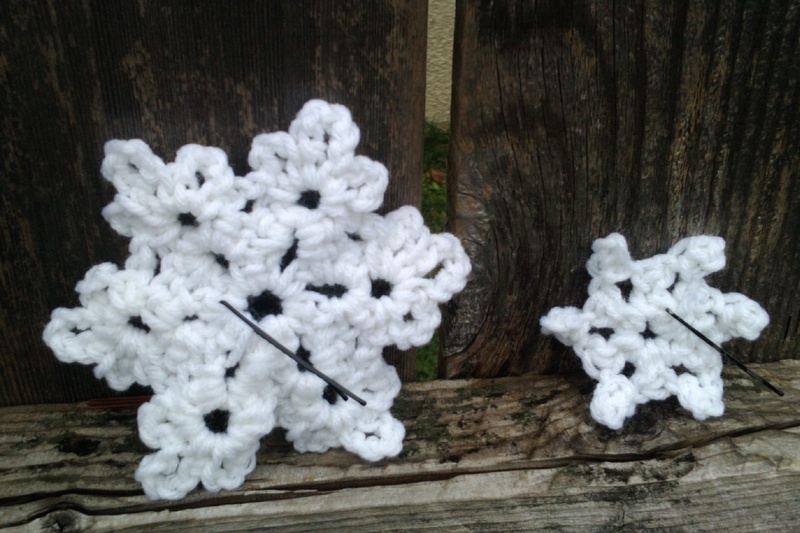 If you like, make some snowflakes and either sew them on or do as I did–just put a hair pin onto the back. Then you can move them around, take them off, wear them on another hat, wear them in your hair…take the hairpin out, add a thread and use them as tree or window ornaments! 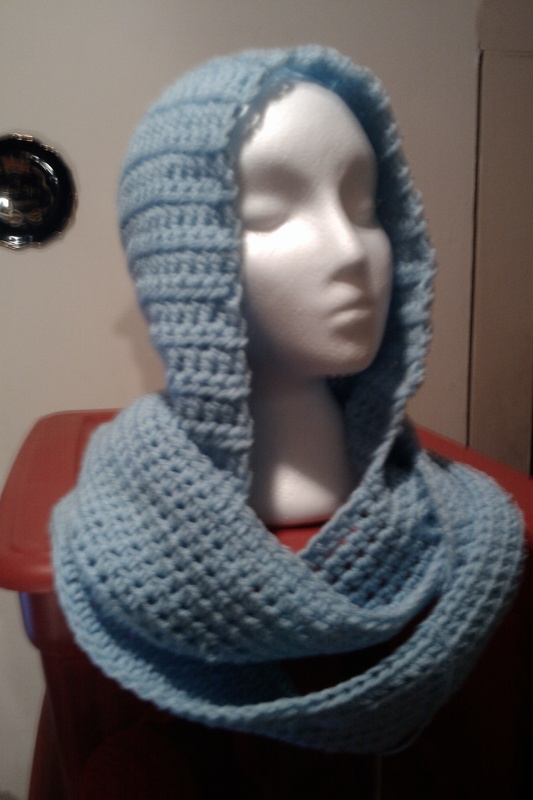 I wanted to show you that you can use any yarn you like, and make a hood that fits you. 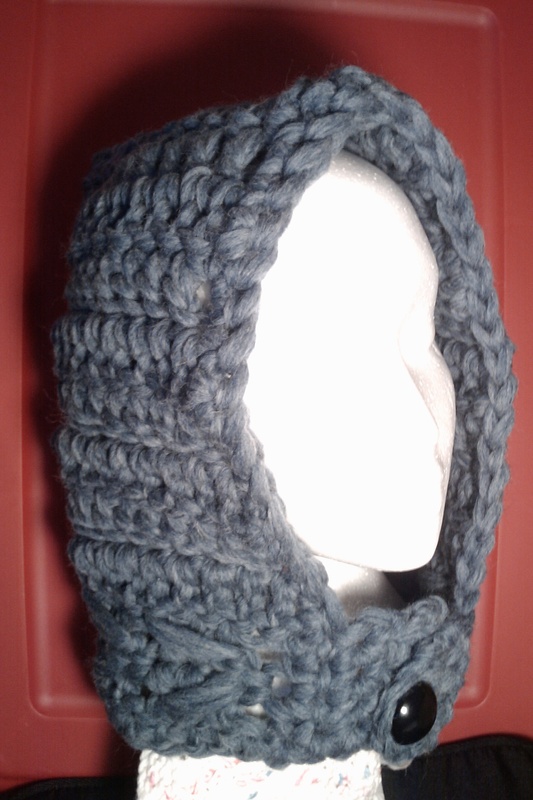 Here is one I made in some vintage White Buffalo 100% wool yarn–a super bulky weight, the same yarn I made my blue “Mount Alberta Hood” with. 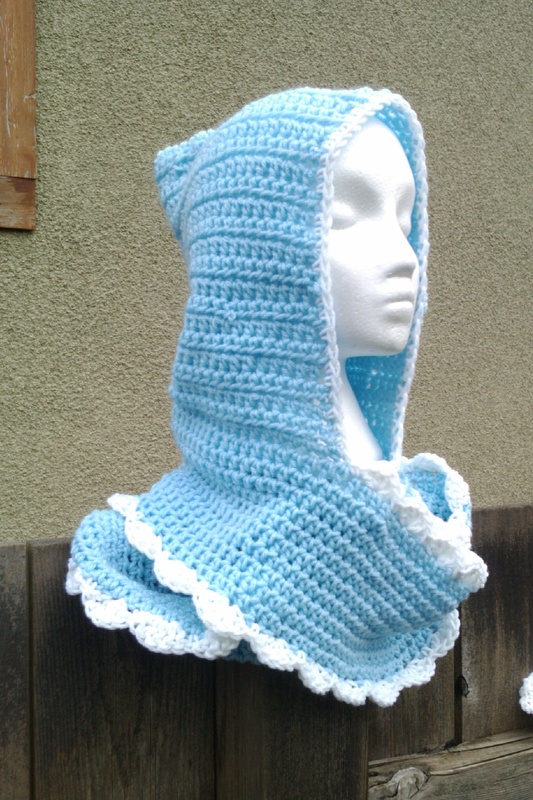 If you want to make a hood like this, you can purchase Briggs & Little “Country Roving”–the yarn my black Mount Alberta Hoods are made with. 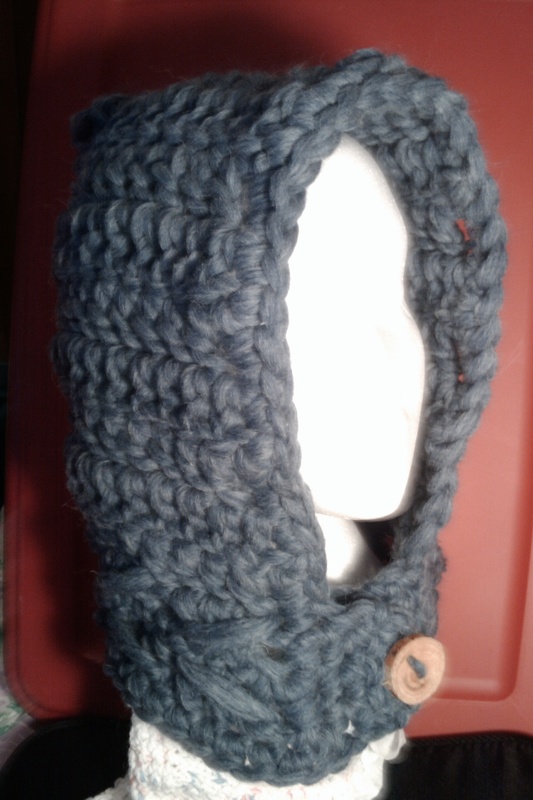 For this Hood I used double crochet and then made a short buttoned cowl. 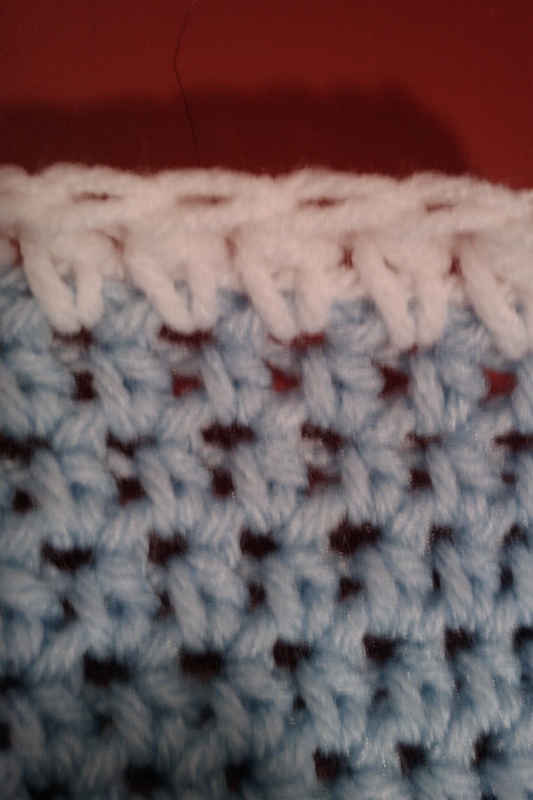 The textured, woven-look border on the bottom is reversible, so I put a different button on each side! 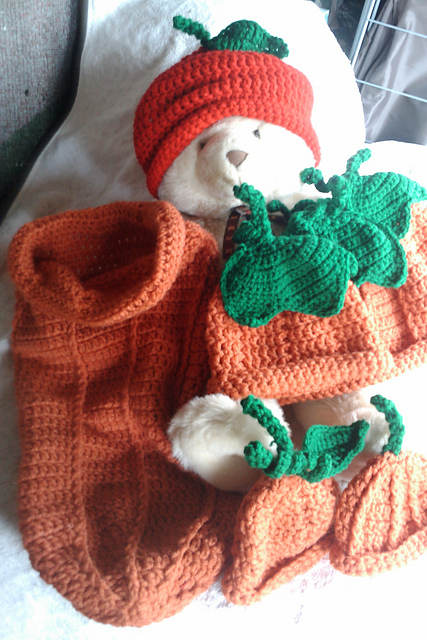 I also made a cute Hood in this style, but using half double crochet for the Hood, to fit a child age 1-3 years. 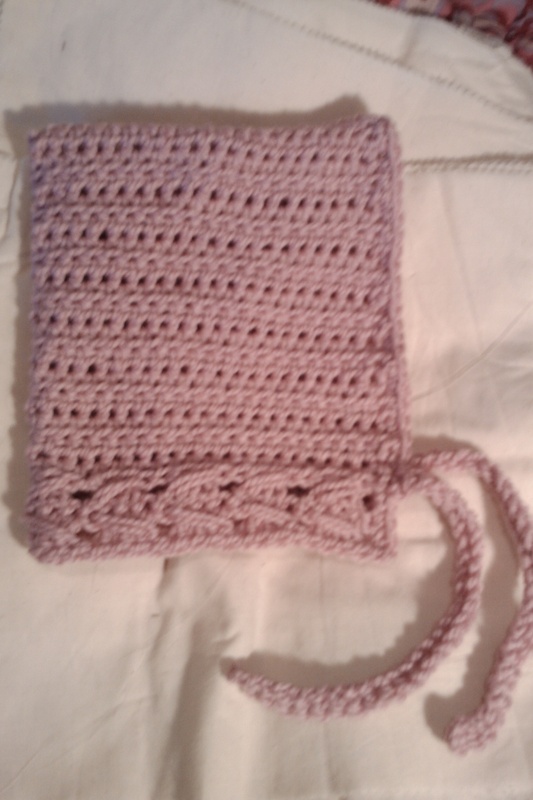 I used Bernat Softee Chunky and a 6mm hook. Instead of a button closing, I added ties. IF YOU SPOT AN ERROR OR NEED HELP, PLEASE SEND ME A MESSAGE ON FACEBOOK or use the contact form here! Please see the Copyright page for further information.